Although 2012 has been proclaimed International Year of Sustainable Energy for All, there has been little progress made in terms of reducing the energy gap in developing countries. The role of renewable energy systems remains uncertain, even though their development is generally supposed to provide universal access to energy. However, there exist low-carbon solutions that ensure access to energy for poor populations and offer them the opportunity to make the most of their privileged access to biomass in the form of energy vectors. Based on a precise assessment of resources and needs of the target populations, certain innovative projects enable real progress to be made in addressing the link between sustainable energy and the fight against poverty. This article analyses the principles underlying three such projects dealing with different energy chains : rural electrification in Morocco, sustainable management of the domestic fuel supply in Niamey, Niger, and production of biofuels in contract farming schemes in West Africa. Alors que 2012 a été déclarée année de internationale de l'énergie durable pour tous, les progrès en termes de réduction de la fracture énergétique dans les pays du Sud restent modestes. Le rôle des énergies renouvelables reste incertain, partant que leur développement entraînera l'accès pour tous à l'énergie. Pourtant, des solutions sobres en carbone existent pour assurer aux populations pauvres un accès à l'énergie et leur donner l'occasion de valoriser sous forme de vecteurs énergétiques leur accès privilégié biomasse. Basés sur un diagnostic précis des ressources et des besoins des populations cibles, certains projets innovants permettent de réelles avancées dans le traitement de l'articulation entre énergie durable et lutte contre la pauvreté. Cet article se propose d'analyser les principes qui sous-tendent trois de ces projets, traitant de filières énergétiques différentes : l’électrification rurale au Maroc, la gestion durable de l'approvisionnement en combustibles domestiques de Niamey au Niger et la production de biocarburant dans des schémas d’agriculture contractualisée en Afrique de l'Ouest. Si bien 2012 ha sido declarado Año Internacional de la Energía Sostenible para todos, los avances realizados para reducir la brecha energética en los países del hemisferio Sur siguen siendo moderados. El papel de las energías renovables sigue siendo incierto, partiendo de que su desarrollo conllevará el acceso a la energía para todo el mundo. No obstante, existen soluciones con un bajo nivel de emisiones de carbono para que las poblaciones pobres puedan acceder a la energía y brindarles la oportunidad de valorar su acceso privilegiado a la biomasa en forma de vectores energéticos. Sobre la base de un diagnóstico preciso de los recursos y las necesidades de las poblaciones objetivo, algunos proyectos innovadores permiten efectuar avances reales en el tratamiento de la articulación entre energía sostenible y lucha contra la pobreza. En este artículo nos proponemos analizar los principios subyacentes a tres de estos proyectos, que tratan de distintos sectores energéticos : la electrificación rural en Marruecos, la gestión sostenible del abastecimiento de combustibles domésticos en Niamey (Níger) y la producción de biocarburante dentro de los programas de agricultura contractual en África occidental. The opinions expressed in this document are those of the author and do not necessarily reflect the views of the Agence Française de Development (French Development Agency). 1Access to energy is once again a current item on national and international agendas. Accordingly, 2012 has been proclaimed the International Year of Sustainable Energy for All. However, the links between poverty and sustainable energy are still poorly understood and there are still only rare real investments in the fight against energy poverty. 2A striking feature of developing countries is the persistent energy gap : there is a marked dichotomy between households using modern energy vectors, hydrocarbon-based for the most part, and those that consume little or no fossil fuels. The former emit just as much CO2 as the populations of OECD countries. The latter group includes the majority of poor households that mostly consume biomass, which, if it is not overexploited, has a neutral impact on climate. 3In most cases, poor households are isolated from formal energy supply chains. Lacking an organised system of electricity distribution, they use dry-cell batteries, paraffin or automotive batteries, which are costly. The traditional biomass they consume is poorly integrated in the formal economic system, although it accounts for up to 90 % of final energy in certain developing countries. 4According to the International Energy Agency, in 2009, 1.3 billion people in the world lacked access to electricity and 2.6 billion depended on traditional biomass for their energy supply. These figures indicate the magnitude of the challenge to be taken up, but are inadequate for developing concrete actions, and it must be noted that sufficient attention is still not given to off-grid energy by decision makers and donors. 5First, it is important to emphasise that energy poverty is manifested differently in urban and rural areas. The solutions also differ in each case. 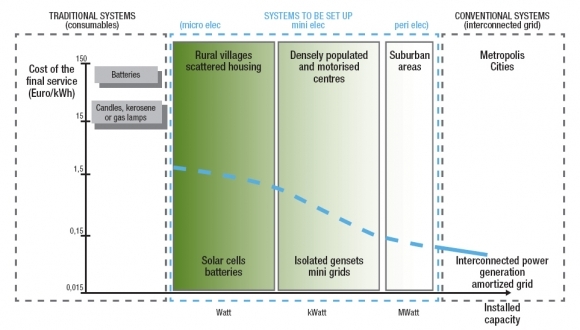 Towns, where the population is wealthier and more concentrated, are the first to be served by modern energy systems. Rural areas, which on the contrary present the constraints of scattered housing and poorer households, with a resulting demand that is low and spread out, are in general not equipped with modern infrastructure. In addition, urban populations are energy consumers, whereas rural populations are energy producers via biomass, which they consume themselves and sell to urban areas. Energy represents an expense for urban dwellers, whereas for rural dwellers, energy also offers revenue opportunities. There are however intermediate settings where the position is less clear – suburban areas, which present different realities : poorly structured urban outskirts, informal shantytowns, secondary centres and towns of varying sizes. In these areas, the population is dense, but revenues are low and services are often inadequate or inexistent. 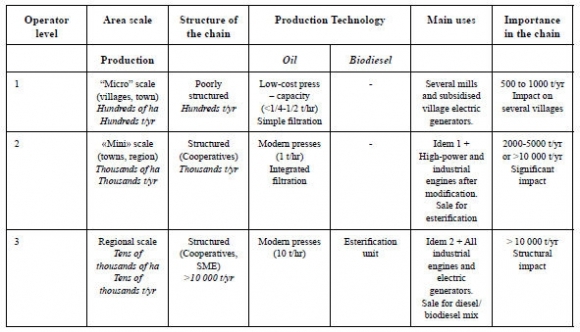 7Thetechnical and economicconstraintsassociated with the chains based on each of these vectors are very different.It is thus necessary to tailor actions and investmentsaccording to the vectors under consideration, emphasising that poor populationscan be integrated into the energy value chain downstream, by gaining access to modern energy services, and upstream, as producers of energy from biomass. 8It is possible to link energy development and the fight against poverty without jeopardising the environment. There exist low-carbon solutions that allow poor populations to be included in efficient energy systems, at the same time enabling them to use local renewable energy sources to their best advantage. 9The actions described in this article illustrate several examples of projects and solutions that can be developed on a large scale. 10The supply and distribution of electricity traditionally requires substantial means : a large infrastructure (grids and power stations), together with a complex technical and business management system. The associated financial constraints make electricity an essentially urban energy, adapted to the population density and the existence of a core of wealthy inhabitants. 11In rural and suburban areas, access to electricity services for a multitude of small consumers in precarious situations requires the implementation of innovative solutions. In these areas, access to electricity, which takes on a socio-economic character, can make the development of renewable local energy sources possible. 12By replacing other energy vectors for certain services (lighting in particular), electricity generates savings and utility gains for households. Certain electricity-specific applications, such as communications, also have a very high use value. At the community level, electricity improves services in dispensaries, schools and public places in general. Last, electricity facilitates the development of motive power. 13The extension of electricity services in developing countries requires combining different modes of electrification depending on the population density in the areas concerned : extension of the interconnected network, generators and local grids, individual solar electrification. 14In sub-Saharan Africa, although there are several examples of successful electrification, national electricity companies, often running at a loss, lack the means to finance extensions of the electricity infrastructure to rural and suburban areas. For this reason, approaches centred on an extension of the grid by the public operator present limitations, whereas decentralised initiatives remain marginal or poorly coordinated. Electrification efforts, often inadequately planned, may lead national companies to make investments that exceed the capacity of customers to pay, exacerbating their deficits. Given these constraints, a pro-active policy for electrification to reduce the energy gap requires a coherent national plan adapted to the individual country context. 15Energy consumption in rural households is low compared with that of their urban counterparts. Electricity needs correspond to basic services : a few hours of lighting, television and charging mobile telephone batteries. The generalisation of access to electricity, even when based on fossil energy, will have only a marginal impact on global greenhouse gas emissions. The use of renewable energy sources therefore addresses less the issue of climate constraints than financial considerations : rural electrification based on renewable energy enables local resources to be used to best advantage while remaining free from the price volatility of fossil energy and the extra costs associated with its transport to isolated areas. Accordingly, in many rural regions, recourse to low-carbon solutions is an economically rational way of enabling poor households to gain access to a quality electricity service. 16The capacity for investment of these households being very low, specific financial schemes are necessary to ensure the continuity of the electricity service : electrification funds, specialised financial institutions or dedicated loan programmes. 17Morocco’s universal rural electrification programme (Programme d'electrification rurale global – PERG) is in this respect a success. Launched in 1996 when the electrification rate of Moroccan villages was 18 %, it has enabled, in less than fifteen years, the extension of electricity services to 97 % of villages. The programme’s approach is original in its universal character at three levels : territorial, in its efforts to cover the entire country, technical, by combining different modes of electrification (centralised and decentralised) and financial, by mobilising different resources and sharing risks. 18The PERG programme also combines grid extension with electrification by individual solar energy systems, adopting a fee-for-service approach for the latter. A service provider, under long-term contract with the Office National d’Électricité (ONE - national electricity agency), is responsible for the provision of individual solar equipment, its maintenance, upgrading and recovery of license fees. In this way, 52 000 households have been able to benefit from photovoltaic equipment. Currently, these public-private partnership agreements are coming to an end and must be renewed. 19It should be noted that the electricity supply model based on photovoltaic systems reaches its limits when interconnected networks are extended. Indeed, the level of service provided by a low voltage individual solar power system cannot compete with connection to the national grid (Figure 2). The more the latter is extended, the more difficult it becomes to get people to accept solar equipment in locations close to the grid. Electrification must therefore evolve and adapt itself accordingly. Figure 1. The different electrification systems that can be set up. 20Wood fuel occupies a vital place in energy consumption in developing countries, especially in sub-Saharan Africa. This situation will be maintained for years to come : from now until 2030, the absolute number of people consuming wood energy is expected to rise by 100 million. Demographic, economic, social and institutional factors explain this increase. The demand for combustible biomass will increase at the same rate as the population, except in certain large towns where fossil energy could replace biomass energy, but undoubtedly at the price of costly subsidies with little social justification. 21Despite its essential place in energy consumption in many countries, wood energy receives little attention from public agencies. National authorities responsible for energy management are divided and poorly coordinated, and generally have limited capacities. Local communities, in a more determinant position, remain inadequately equipped to ensure the efficient management of natural forests. 22In the rural setting, firewood is supplied by an informal process : it is harvested in nearby fields or forests, often by women and children. The unit energy consumption of rural households is low, but rural population growth leads to increased wood harvesting which, in the long term, threatens certain supply basins. A reduction in the mean diameter of wood is also observed over time. 24To satisfy this demand, unmanaged exploitation is carried out with complete disregard for resource protection, resulting in the overexploitation of the sources closest to the town. Since no one is really responsible for managing the wood resource, its renewal is jeopardised. While land clearing for farming is the most important cause of the destruction of forest coverage, the harvest of energy wood comes in second, in front of drought and overgrazing. Just as actions must be implemented at different levels of the production chain (resource management, carbonisation, household stoves and fireplaces), the management of natural forests appears to be a determinant factor in maintaining economic and ecological balance. 25The supply of firewood and charcoal represents an important market and an activity that generates substantial revenue. In the case of uncontrolled exploitation, this revenue is almost entirely captured by a few large operators established in towns. Backed by the progress of decentralisation, the setting up of rural wood markets helps return the profits from the rational exploitation of their biomass resource to rural populations. The issue is thus one of structuring the supply chain of household fuel in towns by developing technical, economical and regulatory management tools, which will make it a factor in the fight against poverty and protection of the environment. 26Since the late 1980s, the government of Niger has been involved in organising the combustible biomass chain, by handing over to villagers the responsibility for managing the forest resource via rural wood markets. The GESFORCOM project in Niger, following the same line as the various projects that preceded it, aims to improve forest governance and reduce rural poverty through the commercial exploitation of forest resources. The town of Torodi provides 47 % of the firewood consumed in the capital, Niamey. Forest covers 48 % of the country, and the exploitable biomass potential is greater than the observed flux of wood. However, between 1996 and 2007, forest coverage diminished by 13 %. The forest of Torodi is therefore an important pool of low-carbon energy but is exploited in a non-sustainable manner. The GESFORCOM project acts to support the town, by setting up a community-based programme and village-based plans for forest management, backed by legal and institutional assistance. 27The results of this pro-active policy are significant. It is estimated that an additional 500 million CFA francs (close to one million euros) have been distributed in the villages, with a significant impact on poverty reduction. Benefiting from the additional revenue, the community has been able to make investments of a socioeconomic nature: water, health and education. To mitigate the recurrent problem of monitoring exploitation quotas and tax levies, community agents have been recruited. This domestic energy strategy in Niger can be regarded as a model of a sustainable method of urban energy wood supply, in countries with heavy constraints on their forest resources, such as the countries of the Sahel. 28The increasing scarcity and rising prices of oil products exert a high constraint on the motor fuel supply chain, making necessary the development of alternative energy sources, in particular biofuels. Investments in this domain have been growing in North America, Europe and Brazil since the 1970s, and are now reaching developing countries. These investments are particularly vulnerable to the price volatility of hydrocarbon products if they are not appropriately regulated. 29In many developing countries, the competition between industrial energy crops and forests and food crops calls into question large-scale investments in biofuels. However, local projects within the framework of contract farming schemes may have a beneficial effect on both poverty and the environment. 30Jatropha curcas, known as pourghère in French-speaking countries, is a plant with agronomic characteristics that are favourable to its use in the development of biofuel supply chains benefiting small-hold farmers and respecting the environment. Grown on the margins of food crops or intercalated with them, jatropha produces oleaginous seeds from which oil can be extracted by simple pressing and filtration. The oil may be used directly as motor fuel after a few engine modifications, or esterified to produce biodiesel, which can replace diesel oil completely (see Figure 3). 31Etherification opens the market for the partial substitution of diesel by biofuel. For this reason, it is a determinant factor for the jatropha seed and oil market. An obligation at national level to incorporate a small proportion of biofuel in diesel enables the creation of a stable market for farm-based production, in which the price is not directly linked to oil prices. These conditions are essential for guaranteeing the survival of the supply chain and to prevent exposing small farm-based operations to market risks they are unable to bear. To fix the size of this market so that the crop remains viable without impinging on food crops or forests, a realistic agronomic and economic assessment of national resources of arable land and water is necessary. Figure 2. The farm-based jatropha biofuel supply chain. 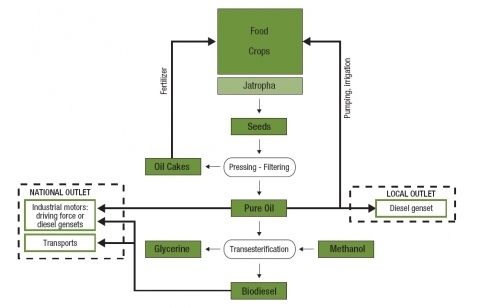 32The by-products of biofuel production may be used to the advantage of food crops (oil cake) or commercially (glycerine). The pure plant oil may be used locally as fuel for electric generators. While this use does not constitute the major outlet, it allows rural populations to produce their own motor fuel. Two parameters are essential for ensuring the long-term viability of the chain : guaranteed purchase prices for jatropha seed and the biofuel, both requiring regulatory control. 33Few countries of developing countries implement policies supporting biofuel programmes for contract farming schemes. There are, however, several pilot projects which are able to provide preliminary feedback on the development of an energy supply chain of this type. The actual operators can be classified into three levels, as shown in Table 1. Level 1, useful in the initial phase, enables the local promotion of jatropha cultivation and the use of the oil, but levels 2 and 3 are determinant for the development of the supply chain. Table 1. Classification of jatropha biofuel operators. 34The development of low-carbon energy does not guarantee an improvement in access to energy for poor populations. The link between energy and the fight against poverty requires specific treatment based on a precise assessment. As far as the access of poor populations to modern energy vectors is concerned, the adoption of conventional solutions has only a small impact on global greenhouse gas emissions. However, renewable energy presents important comparative advantages in the supply of electricity to isolated populations. In addition, the development and structuring of the biomass energy system to which rural populations have privileged access enables the creation of value, which benefits poor populations while promoting energy with a favourable carbon footprint. 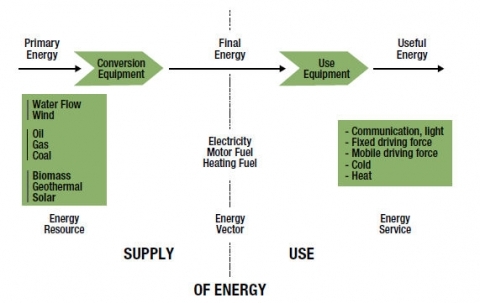 35Solutions for fighting poverty through low-carbon energy do therefore exist, but they differ greatly depending on the context and the energy vector in question. They are based on chains with quite distinct technical and economical characteristics. They have, however, a point in common, in that they require a long-term commitment to implementing the public policies essential for promoting investment in these domains with a strong social component. Some countries have succeeded in establishing a pro-active institutional framework for certain energy-related aspects of the link between energy and the fight against poverty. The challenge is to extend these practices so as to reduce the energy gap characteristic of developing countries.